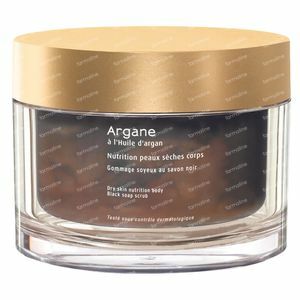 Galénic Argane Peeling Brown Soap Body 200 ml order online. Inspired by Moroccan traditions, Black Soap Body Scrub has an intoxicating fragrance and leaves skin soft, smooth and clear. Exfoliate to rehydrate* and enhance the beauty of your body. Apply all over body 1-2 times per week to dry skin. Gently massage for 2-3 minutes. Wait a moment, then rinse off body scrub in the shower with massaging motions. Use instead of your usual soap. WATER (AQUA). OLIVE ACID. OLEA EUROPAEA FRUIT OIL. ARGANIA SPINOSA SHELL POWDER. GLYCERIN. FRAGRANCE (PARFUM). ARGANIA SPINOSA KERNEL OIL. BETA SITOSTEROL. CARAMEL. HYDROXYETHYLCELLULOSE. POTASSIUM HYDROXIDE. SODIUM CHLORIDE. SODIUM HYDROXIDE. TETRASODIUM GLUTAMATE DIACETATE. TOCOPHEROL.